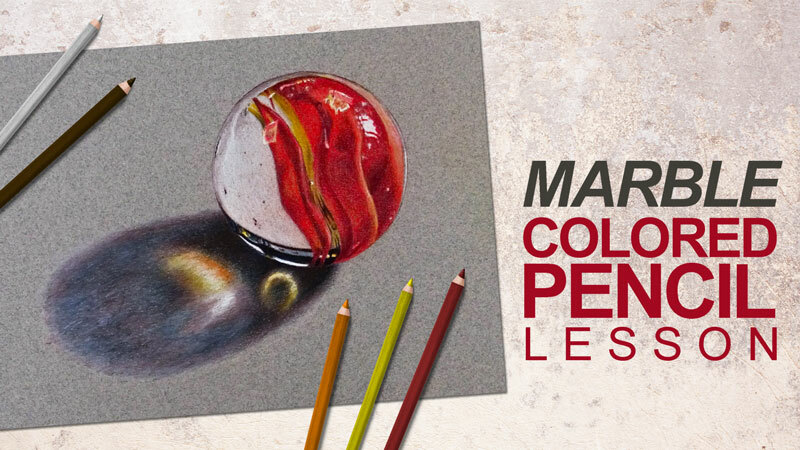 Learn how to draw a realistic marble with colored pencils. Learn basic colored pencil techniques. This is what you need to draw with colored pencils. An introduction to "The Colored Pencil Course" and a look at the materials that will be used. The basics of drawing with colored pencils including the "5 do's for better hues". Learn how to use basic color theory with colored pencils in this module from "The Colored Pencil Course". Not every pencil with color is a "colored pencil". Learn the differences between wax-based and oil-based colored pencils. Learn basic colored pencil drawing techniques. Wax-based colored pencils produce a milky white coating after a while. Here's how to stop it. Learn how to draw a realistic mouth with colored pencils. Mix dark skin tones to complete a colored pencil portrait. Learn how to draw a realistic nose wtih colored pencils. Learn how to draw realistic cat eyes with colored pencils. Learn how to draw a tiger with oil-based colored pencils. Learn how to draw a frog with tinted graphite in this step by step lesson. 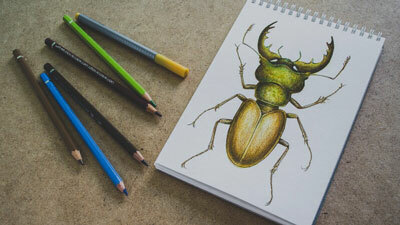 Learn how to create the illusion of texture in a colored pencil drawing. A series on drawing a butterfly with colored pencils. 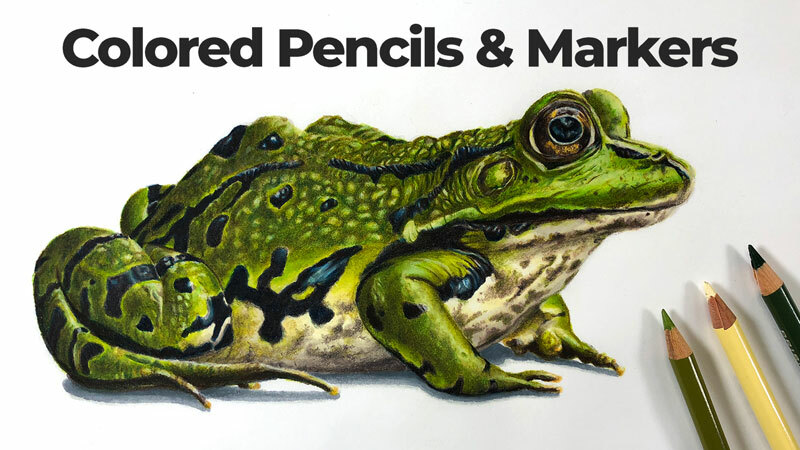 Learn how to use colored pencils to draw a realistic tree frog. Learn how to draw grapes with colored pencils in this step by step lesson. See how drawing on toned paper with colored pencils gives you an advantage. A look at drawing with Ariana's Art colored pencils. A realistic drawing of a crushed can is completed. Learn how to draw glass with colored pencils. Learn the importance of value and underpainting with colored pencils. Learn how to create the illusion of reflection and transparency with colored pencils. Watch and learn how to create the illusion of reflective and transparent marbles. Learn how to draw realistic cherries. This medium is one of my favorites because of it's ability to create detailed drawings. Colored pencils are easy to use "on-site" and are clean enough to use anywhere. Colored pencils are a drawing medium that usually consists of waxy (or oil-based) shafts of pigment held together in a wooden shaft. Colored pencils vary greatly in price and quality. Softer varieties are generally more desirable for drawing and are usually more expensive as well. Colored pencils can be used on a variety of surfaces, but drawing papers are generally the choice of most artists. Looking to pick up some colored pencils, but don't know which brand to buy? Check out my comparison chart and see which brands I recommend here.